The Chicago River is a system of rivers and canals with a combined length of 156 miles (251 km)  that runs through the city of Chicago, including its center (the Chicago Loop). Though not especially long, the river is notable because it is one of the reasons for Chicago's geographic importance: the related Chicago Portage is a link between the Great Lakes and the Mississippi River Basin, and ultimately the Gulf of Mexico. The river is represented on the Municipal Flag of Chicago by two horizontal blue stripes. Its three branches serve as the inspiration for the Municipal Device,    a three-branched, Y-shaped symbol that is found on many buildings and other structures throughout Chicago. When it followed its natural course, the North and South Branches of the Chicago River converged at Wolf Point to form the Main Stem, which jogged southward from the present course of the river to avoid a baymouth bar, entering Lake Michigan at about the level of present-day Madison Street. Today, the Main Stem of the Chicago River flows west from Lake Michigan to Wolf Point, where it converges with the North Branch to form the South Branch, which flows southwest and empties into the Chicago Sanitary and Ship Canal. A baymouth bar is a depositional feature as a result of longshore drift. It is a sandbank that partially or completely closes access to a bay. Madison Street is a major east–west street in Chicago, Illinois. Prior to human intervention, the Chicago River emptied into Lake Michigan at the present day intersection of Madison Street and Michigan Avenue. The Chicago Sanitary and Ship Canal, historically known as the Chicago Drainage Canal, is a 28-mile-long (45 km) canal system that connects the Chicago River to the Des Plaines River. It reverses the direction of the Main Stem and the South Branch of the Chicago River, which now flows out of Lake Michigan rather than into it. The related Calumet-Saganashkee Channel does the same for the Calumet River a short distance to the south, joining the Chicago canal about halfway along its route to the Des Plaines. The two provide the only navigation for ships between the Great Lakes Waterway and the Mississippi River system. The Skokie River is a 20-mile-long (32 km) river that flows through the northern suburbs of Chicago, Illinois. It flows almost parallel to the shore of Lake Michigan, and historically discharged its outflow into that lake via the Chicago River. However, the construction of the Chicago Sanitary and Ship Canal in 1900 caused the drainage of the Chicago River, including its Skokie River tributary, to flow southwestward towards the Mississippi River. Waukegan is the largest city in and the county seat of Lake County, Illinois, United States, a part of the Chicago metropolitan area. The city is located 35 miles north of the Loop and 10 miles south of the Wisconsin state border, approximately halfway between Chicago and Milwaukee. As of the 2013 United States Census estimate, the city has a population of 88,826, which makes it the ninth most populous city in Illinois. Waukegan is a predominately working-class community with a size-able middle-class population. Devon Avenue is a major east-west street in the Chicago metropolitan area. It begins at Chicago's Sheridan Road, which borders Lake Michigan, and it runs west until merging with Higgins Road near O'Hare International Airport. Devon continues on the opposite side of the airport and runs intermittently through Chicago's northwestern suburbs. In the northwest suburbs west of O'Hare Airport, Devon Avenue is the boundary between Cook and DuPage counties. The street is located at 6400 N in Chicago's address system. South of Belmont the North Branch is lined with a mixture of residential developments, retail parks, and industry until it reaches the industrial area known as the Clybourn Corridor. Here it passes beneath the Cortland Street Drawbridge, which was the first 'Chicago-style' fixed-trunnion bascule bridge built in the United States,  and is designated as an ASCE Civil Engineering Landmark and a Chicago Landmark. At North Avenue, south of the North Avenue Bridge, the North Branch divides, the original course of the river makes a curve along the west side of Goose Island, whilst the North Branch Canal cuts off the bend, forming the island. The North Branch Canal—or Ogden's Canal—was completed in 1857, and was originally 50 feet (15 m) wide and 10 feet (3.0 m) deep allowing craft navigating the river to avoid the bend. The 1902 Cherry Avenue Bridge, just south of North Avenue, was constructed to carry the Chicago, Milwaukee and St. Paul Railway onto Goose Island. It is a rare example of an asymmetric bob-tail swing bridge  and was designated a Chicago Landmark in 2007. From Goose Island the North Branch continues to flow south east to Wolf Point where it joins the Main Stem. The Main Stem flows 1.5 miles (2.4 km) west from the controlling works at Lake Michigan;  passing beneath the Outer Drive, Columbus Drive, Michigan Avenue, Wabash Avenue, State Street, Dearborn Street, Clark Street, La Salle Street, Wells Street, and Franklin Street bridges en route to its confluence with the North Branch at Wolf Point. At McClurg Court it passes the Nicholas J Melas Centennial Fountain, which was built in 1989 to celebrate the 100th anniversary of the Metropolitan Water Reclamation District of Greater Chicago; between May and October the fountain sends an arc of water over the river for ten minutes every hour. On the north bank of the river, near the Chicago Landmark Michigan Avenue Bridge, is Pioneer Court, which marks the site of the homestead of Jean Baptiste Point du Sable who is recognized as the founder of Chicago. On the south bank of the river is the site of Fort Dearborn, an army fort, first established in 1803. Notable buildings surrounding this area include the NBC Tower, the Tribune Tower, and the Wrigley Building. The river turns slightly to the south west between Michigan Avenue and State Street, passing the Trump International Hotel and Tower, 35 East Wacker, and 330 North Wabash. Turning west again the river passes Marina City, the Reid, Murdoch & Co. Building, and Merchandise Mart, and 333 Wacker Drive. Before reversal, the South Branch generally arose with joining forks in the marshy area called Mud Lake to flow to where it met the North Branch at Wolf Point forming the main branch. Since reversal, the source of the South Branch of the Chicago River is the confluence of the North Branch and Main stem at Wolf Point. From here the river flows south passing the Lake Street, Randolph Street, Washington Street, Madison Street, Monroe Street, Adams Street, Jackson Boulevard, Van Buren Street, Ida B. Wells Drive, and Harrison Street bridges before leaving the downtown Loop community area. Notable buildings that line this stretch of the river include the Boeing Company World Headquarters, the Civic Opera House, the Chicago Mercantile Exchange, Union Station and Willis Tower. At Ashland Avenue the river widens to form the U.S. Turning Basin, the west bank of which was the starting point of the Illinois and Michigan Canal. Prior to 1983, this was where the US Coast Guard Rules of the Road, Great Lakes ended & Rules of the Road, Western Rivers began. Since 1983, there is just a single Inland Navigational Rules passed by Congressional Act in 1980 (Public Law 96-591). At the basin the river is joined by a tributary, the South Fork of the river, which is commonly given the nickname Bubbly Creek. A bridge used to span the South Fork at this point that was too low for boats to pass meaning that their cargo needed to be unloaded at the bridge, and the neighborhood at its east end became known as Bridgeport. The river continues to the south west, entering the Chicago Sanitary and Ship Canal at Damen Avenue. The original West Fork of the South Branch, which before 1935  led towards Mud Lake and the Chicago Portage, has been filled in; a triangular intrusion into the north bank at Damen Avenue marks the place where it diverged from the course of the canal. From there, the water flows down the canal through the southwest side of Chicago and southwestern suburbs and, in time, into the Des Plaines River between Crest Hill on the west and Lockport on the east, just north of the border between Crest Hill and Joliet, Illinois, eventually reaching the Gulf of Mexico. Louis Jolliet and Jacques Marquette, though probably not the first Europeans to visit the area, are the first recorded to have visited the Chicago River in 1673, when they wrote of their discovery of the geographically vital Chicago Portage. Marquette returned in 1674, camped a few days near the mouth of the river, then moved on to the Chicago River–Des Plaines River portage, where he stayed through the winter of 1674–75. The Fox Wars effectively closed the Chicago area to Europeans in the first part of the 18th century. The first non-native to re-settle in the area may have been a trader named Guillory, who might have had a trading post near Wolf Point on the Chicago River in around 1778. In 1823 a government expedition used the name Gary River (phonetic spelling of Guillory) to refer to the north branch of the Chicago River. Finally, in 1900, the Sanitary District of Chicago, then headed by William Boldenweck, completely reversed the flow of the Main Stem and South Branch of the river using a series of canal locks, increasing the river's flow from Lake Michigan and causing it to empty into the newly completed Chicago Sanitary and Ship Canal. 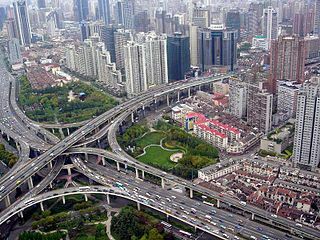 In 1999, this system was named a "Civil Engineering Monument of the Millennium" by the American Society of Civil Engineers (ASCE). Before this time, the Chicago River was known by many local residents of Chicago as "the stinking river" because of the massive amounts of sewage and pollution that poured into the river from Chicago's booming industrial economy. In 1915, the Eastland , an excursion boat docked at the Clark Street bridge, rolled over, killing 844 passengers. Many of the passengers were trapped by moving objects such as pianos and tables. The site is now the location of a memorial dedicated in 1989. The marker was stolen in 2000 and replaced in 2003. There are plans to build an outdoor exhibit at the site as well. The first bridge across the Chicago River was constructed over the North Branch near the present day Kinzie Street in 1832. A second bridge, over the South Branch near Randolph Street, was added in 1833. The first moveable bridge was constructed across the main stem at Dearborn Street in 1834. Today, the Chicago River has 38 movable bridges spanning it, down from a peak of 52 bridges. These bridges are of several different types, including trunnion bascule, Scherzer rolling lift, swing bridges, and vertical lift bridges. As part of a more than fifty-year-old Chicago tradition, the Chicago River is dyed green in observance of St. Patrick's Day. The actual event does not necessarily occur on St. Patrick's Day and is scheduled for the Saturday before March 17, unless the 17th falls on a Saturday (when the event takes place on St. Patrick's Day). ↑ "About Friends of the Chicago River". Friends of the Chicago River. Retrieved May 20, 2007. ↑ "Where is the Chicago River?". Friends of the Chicago River. Retrieved August 18, 2014. 1 2 Hill, Libby (2000). The Chicago River, A Natural and Unnatural History. Chicago: Lake Claremont Press. pp. 139–151. ISBN 1-893121-02-X. 1 2 Chicago River/Lakeshore Area Assessment (PDF) (Report). 2. 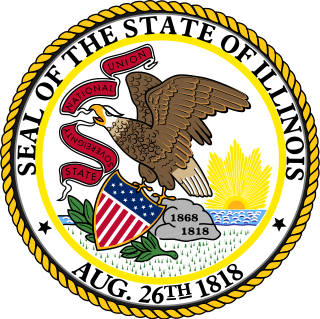 Department of Natural Resources, State of Illinois. October 2000. p. 4. 1 2 3 4 US Army Corps of Engineers (December 26, 2012). How the Chicago District has 'weathered' recent storm events (Report). 1 2 "Chicago Wastewater System". American Society of Civil Engineers. Retrieved May 15, 2011. ↑ "Municipal Flag of Chicago" . Retrieved May 12, 2010. ↑ "The Chicago Municipal Device (Y-Shaped Figure)". Chicago Public Library. Archived from the original on September 3, 2006. Retrieved June 20, 2007. ↑ "The Municipal Device". Forgotten Chicago. Retrieved June 20, 2007. ↑ "Chicago's municipal device: The city's symbol lurking in plain sight". WBEZ . Retrieved September 7, 2014. ↑ Keating, William H. (1824). Narrative of an expedition to the source of St. Peter's river, Lake Winnepeek, Lake of the Woods, &c., performed in the year 1823 (volume 1). H. C. Carey & I. Lea. p. 172. Retrieved October 30, 2010. ↑ Megan, Graydon (December 12, 2012). "Ralph Frese, 1926-2012". Chicago Tribune. Retrieved November 18, 2013. ↑ "Ralph Frese, 1926 – 2012". Forest Preserves of Cook County. Forest Preserve District of Cook County. Retrieved November 18, 2013. ↑ Hess, Jeffrey A. (1999). "North Avenue Bridge: HAER No. IL-154". National Park Service. Retrieved July 17, 2008. ↑ "Chicago, Milwaukee & St. Paul Railway, Bridge No. Z-2, Spanning North Branch Canal at North Cherry Avenue, Chicago, Cook County, IL". Historic American Engineering Record. Retrieved May 3, 2009. ↑ "Chicago Landmarks: Individual Landmarks and Landmark Districts designated as of January 1, 2008" (PDF). Commission on Chicago Landmarks. January 1, 2008. ↑ García, Carlos M.; Oberg, Kevin; García, Marcelo H. (December 2007). "ADCP Measurements of Gravity Currents in the Chicago River, Illinois". Journal of Hydraulic Engineering. 133 (12): 1356–1366. doi:10.1061/(ASCE)0733-9429(2007)133:12(1356). ↑ "Title 33 of the Code of Federal Regulations 207.420" . Retrieved November 19, 2011. ↑ Jaffe, Martin (June 2009). "Water Supply Planning in the Chicago Metropolitan Region" (PDF). Sea Grant Law and Policy Journal. 2 (1): 1–21. Retrieved November 19, 2011. ↑ "Chicago River & North Shore Channel River Corridors & Wilmette Harbor" (PDF). Illinois Coastal Management. Retrieved November 19, 2011. ↑ A Native's Guide to Chicago. Lake Claremont Press. 2004. p. 48. ISBN 978-1-893121-23-2. ↑ Baumann, Timothy E. (December 2005). "The Du Sable Grave Project in St. Charles, Missouri". The Missouri Archaeologist. 66: 59–76. ↑ Husar, John (December 12, 1996). "Maps Unlock River's History". Chicago Tribune. Retrieved September 9, 2018. ↑ "Chicago River Straightening". The Electronic Encyclopedia of Chicago. Chicago Historical Society. Retrieved November 20, 2011. 1 2 Husar, John (December 12, 1996). "Maps Unlock River's History". Chicago Tribune. Retrieved November 19, 2011. ↑ Cahan, Richard; Williams, Michael (2011). The Lost Panoramas: When Chicago Changed its River and the Land Beyond. Cityfiles Press. p. 107. ISBN 978-0-9785450-7-9. ↑ "Annual statistics for USGS 05536118 North Branch of Chicago River at Grand Avenue at Chicago, IL". United States Geological Survey. Retrieved November 27, 2011. ↑ Jackson, P. Ryan; Garcia, Carlos M.; Oberg, Kevin A.; Johnson, Kevin K.; Garcia, Marcelo H. (2008). "Density currents in the Chicago River: Characterization, effects on water quality, and potential sources". Science of the Total Environment. 401 (1–3): 130–143. doi:10.1016/j.scitotenv.2008.04.011. PMID 18499229. ↑ "Annual statistics for USGS 05536123 Chicago River at Columbus Drive at Chicago, IL". United States Geological Survey. Retrieved November 27, 2011. ↑ Durkin Keating, Ann (2005). "Chicago". Encyclopedia of Chicago. Retrieved February 8, 2018. ↑ Zeldes, Leah A. (April 5, 2010). "Ramping up: Chicago by any other name would smell as sweet". Dining Chicago. Chicago's Restaurant & Entertainment Guide, Inc. Retrieved May 2, 2010. ↑ Swenson, John F. (Winter 1991). "Chicago: Meaning of the Name and Location of Pre-1800 European Settlements". Early Chicago. Retrieved May 22, 2010. ↑ Meehan, Thomas A (1963). "Jean Baptiste Point du Sable, the First Chicagoan". Journal of the Illinois State Historical Society. Illinois State Historical Society. 56 (3): 439–453. JSTOR 40190620. ↑ Pacyga, Dominic A. (2009). Chicago: A Biography. University of Chicago Press. p. 12. ISBN 0-226-64431-6. ↑ Letter from Antoine Ouilmette to John H. Kinzie dated June 1, 1839, reproduced in Blanchard, Rufus (1898). Discovery and Conquests of the Northwest, with the History of Chicago (volume 1). R. Blanchard and Company. p. 574. Retrieved November 19, 2011. ↑ Charles J. Kappler (1904). "Treaty with the Wyandot, Etc., 1795". U.S. Government treaties with American Indian tribes. Oklahoma State University Library. Retrieved August 1, 2009. ↑ "Fort Dearborn". Encyclopedia.chicagohistory.org. Retrieved March 2, 2019. ↑ Durkin Keating, Ann. "Fort Dearborn". Encyclopedia of Chicago. Chicago Historical Society. p. 477. Retrieved May 20, 2007. 1 2 3 Holland, Robert A. (2005). Chicago in Maps. New York: Rizzoli International Publications. pp. 102–109. ISBN 978-0-8478-2743-5. ↑ "Consumer Price Index (estimate) 1800–". Federal Reserve Bank of Minneapolis. Retrieved December 4, 2011. ↑ Schroer, Blanche; Peterson, Grant; Bradford, S. Sydney (September 14, 1975). "National Register of Historic Places Inventory-Nomination: Illinois and Michigan Canal" (PDF). National Park Service. Retrieved June 21, 2009. ↑ Killey, Myrna M. 1998. 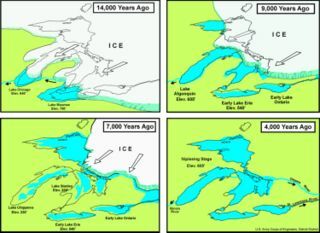 "Illinois' Ice Age Legacy." Illinois State Geological Survey GeoScience Education Series 14. ↑ "Did 90,000 people die of typhoid fever and cholera in Chicago in 1885?". The Straight Dope. Retrieved May 20, 2007. ↑ Cain, Louis P. "Water". Encyclopedia of Chicago. Chicago Historical Society. p. 1324. Retrieved May 20, 2007. ↑ "The River Under the River". Department of Civil & Environmental Engineering (CEE) at the University of Illinois. Archived from the original on April 25, 2007. Retrieved May 20, 2007. ↑ "Lake Michigan Diversion Supreme Court Consent Decree" (PDF). Deq.state.mi.us. Retrieved March 2, 2019. ↑ "Groups to study separating Great Lakes and Mississippi River basins". The Pantagraph . Archived from the original on May 25, 2012. Retrieved February 21, 2009. ↑ Hilton, George W. "Eastland". Encyclopedia of Chicago. Chicago Historical Society. p. 408. Retrieved May 20, 2007. ↑ Chicago, 1835 (Map). Albert F. Scharf. 1908. ↑ "Illinois Fish Advisory: Chicago River". Illinois Department of Public Health. Retrieved March 17, 2008. ↑ Stern, Andrew (February 20, 2006). "Scientists Fear Leaping Carp To Invade US Great Lakes". Reuters. Retrieved December 20, 2007. ↑ O'Connell, Patrick M. (June 22, 2018). "A 'wild mile' on the Chicago River? It might be closer than you think". Chicago Tribune. Retrieved June 24, 2018. ↑ "Boathouses - Chicago Park District" . Retrieved September 10, 2018. ↑ "Dyeing of the River". St. Patrick's Day Parade. Saint Patrick's Day Parade Committee of Chicago. 2009. Archived from the original on June 14, 2009. Retrieved June 14, 2009. 1 2 Battle, British (March 20, 2003). "Other cities dye-ing to know what turns Chicago River green". The Columbia Chronicle . The Fairfield Mirror, via UWIRE. Archived from the original on April 19, 2009. ↑ "Green Chicago River". Sponsor website. Retrieved May 15, 2011. ↑ Lydon, Dan. "The Man Who Dyed the River Green: Stephen M. Bailey". Archived from the original on June 23, 2011. Retrieved March 16, 2011. ↑ O'Carroll, Eoin. 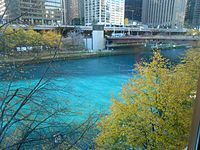 "Is the dye in the Chicago River really green?" . Retrieved November 13, 2013. ↑ Sadovi, Maura Webber (March 17, 2005). "Q&A with Laurene von Klan, executive director of Friends of the Chicago River". Chicago Tribune. Retrieved November 13, 2013. ↑ staff, Chicago Tribune. "Chicago River is dyed blue for Cubs celebration". Chicagotribune.com. Retrieved March 2, 2019. ↑ "Continuing Drought Could Lead To Reversal Of Chicago River Flow". January 9, 2013. ↑ "MWRD: Not possible for Chicago River to reverse on its own due to low lake level" (PDF). Press Release. Metropolitan Water Reclamation District of Greater Chicago. January 10, 2013. Retrieved January 12, 2013. ↑ Flannery, Mike (January 9, 2013). "Drought won't affect Chicago River much after all". Chicago News and Weather. FOX 32 News. ↑ "Lake Huron, Lake Michigan hit lowest water levels on record". Cbc.ca. Associated Press. February 8, 2013. Andreas, Alfred Theodore (1884). History of Chicago. From the earliest period to the present time (volume 1) . Retrieved October 30, 2010. Wikimedia Commons has media related to Chicago River . Wikisource has the text of the 1905 New International Encyclopedia article Chicago River . "Chicago River" . Collier's New Encyclopedia . 1921. Goose Island is a 160 acres (0.65 km2) artificial island in Chicago, Illinois, formed by the North Branch of the Chicago River on the west and the North Branch Canal on the east. It is about 1.5 miles (2.4 km) long and 0.5 miles (0.80 km) across at its widest point. The North Shore Channel is a drainage canal built between 1907 and 1910 to flush the sewage-filled North Branch of the Chicago River down the Chicago Sanitary and Ship Canal. The sewage carrying duty has been largely taken over by the Chicago Deep Tunnel, but there are still occasional discharges due to heavy rains. Rush Street is a one-way street in the Near North Side community area of Chicago in Cook County, Illinois, United States. The street, which starts at the Chicago River between Wabash and North Michigan Avenues, runs directly north until it slants on a diagonal as it crosses Chicago Avenue then it continues to Cedar and State Streets, making it slightly less than a mile long. One lane also runs southbound from Ohio Street (600N) to Kinzie Street (400N) as part of a two-way street segment. It runs parallel to and one block west of the Magnificent Mile on the two-way traffic North Michigan Avenue, which runs at 100 east up to 950 north. The street, which is also one block east of the one-way southbound Wabash Avenue, formerly ran slightly further south to the Chicago River where over time various bridges connected it to the Loop, Chicago's central business district. The Chicago and North Western Railway's Kinzie Street railroad bridge is a single leaf bascule bridge across the north branch of the Chicago River in downtown Chicago, Illinois. At the time of its opening in 1908 it was the world's longest and heaviest bascule bridge. Previous bridges on the same site included the first bridge to cross the Chicago River, Chicago's first railroad bridge, and one of the first all-steel bridges in the United States. The Cherry Avenue Bridge is an asymmetric bob-tail swing bridge in Chicago, Illinois that carries the Chicago Terminal Railroad, pedestrians, and cyclists across the North Branch Canal of the Chicago River. It was constructed in 1901–02 by the Chicago, Milwaukee and St. Paul Railway, and it is a rare example of this type of bridge; it was designated a Chicago Landmark on December 12, 2007. Sag Bridge, Illinois is a populated place in southwestern Cook County, Illinois. Sag Bridge is an important waterway junction between the Calumet Sag Channel and the Chicago Sanitary and Ship Canal. It is also the junction of IL 83 and IL 171 which meet at Sag Bridge to cross the Calumet Sag Channel together on the eponymous bridge. 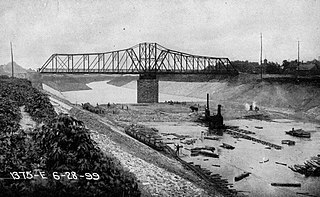 The community was named for a predecessor of the present bridge. It is within the village limits and postal delivery zone of Lemont, Illinois. The Sheldrake River is a freshwater stream located in Southern Westchester County, New York. The river forms in White Plains and flows six miles (9.7 km) south until it joins the Mamaroneck River. Approximately 1.58 miles (2.54 km) of the Sheldrake River flow through Scarsdale, 2.13 miles (3.43 km) through New Rochelle and two miles (3.2 km) through the Town of Mamaroneck.